the best burger i have ever had was at taylor's refresher in st. helena, calif. it was fairly spectacular. alan, ronnie and i stopped there while we were touring wineries in napa. it was the most expensive burger i've ever had, but it was awesome. and the garlic fries. and the caramel-ginger shake. mmmmmm. anyway, the burger, fries and shake were almost $20. each of us spent that. none of us complained about it. fast forward about a year, and alan and i were listening to lawrence talk about going to square 1 burger in tampa, telling us it was really good, but it was pretty expensive. he told us that a burger, fries and tea could run you $17. almost in unison, alan and i were like, "that's almost as much as taylor's." we were skeptical whether it could be as good. i finally went today. it was ok. it was no taylor's. pam got the chili cheese burger, and i got the decadent burger. pam's was pretty straight forward. chili, cheese, burger. mine was a bit more complicated. it was kobe beef, allegedly, with caramelized onions and brie. i asked for gruyere instead of brie. we asked for them to be cooked medium. i was glad they asked, because some places won't even serve below well done. well, they asked, we said medium, and it came well done. actually, what's the next thing after well done? right after the waitress left, pam asked if i should get it under medium, since it was kobe. a) i doubt it was kobe, and b) once it was well done, there was no way to possibly appreciate it if it was. shrug. i didn't send it back because i can enjoy a well done burger. and it was fine. it was just really, really cooked. ultimately, to its detriment. shrug. the burger itself was remarkably messy. when i picked it up, the onions just started leaking out all over the place. when i went to put it down, i needed to get a side plate, because i couldn't put it down on the plate again after all the juice was down there. also, it took like three bites before i was getting burger, because it was smaller than the bun and it kept sliding. it wasn't bad, but for the price, it was a little disappointing. i think i would've been fine with it if i hadn't gotten the kobe, with the kobe price tag. oh well. anyway, we also got an order of the 50-50, which was two cones of fries, one normal fries and the other sweet potato with cinnamon-sugar. for the regular fries, there was a chipotle ketchup which was the best thing we had. it was amazing. i think i could be talked into going back just to get fries with this ketchup. it was a nice room. it looks tiny from the street, but it is a pretty big room inside. and it is table service. with china. and its very south tampa chic. to be fair, taylor's is a walk-up roadside stand with picnic tables. of course, those picnic tables are in napa. so, taylor's wins this round, too. and i would ask for medium rare. and stress it. when we moved to the bay area, lo these many years ago, there were two restaurants i had heard of in tampa and was interested in checking out. one was berns, and we went there sometime the first year we were here. it was good, particularly the dessert room. the other was mise en place. we didn't go there immediately, and somehow it fell off the radar. well, until i got an e-mail from phil davis saying he wanted to get a group together to celebrate kristen walbolt's birthday. great idea. we're there. one of the reasons it had fallen off my radar was that i had heard that maybe it was a little overrated, a little overpriced and that the food was a little too precious -- read: tiny. and there was some of that. but truth is, for pam and i, it was not that expensive, and we had plenty of food, cumulatively, even if some of it was tiny. 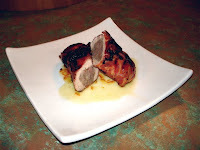 i started out with the duo of duck, which is under the "first plates" section of the menu. 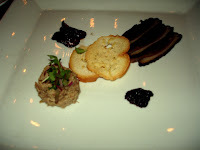 here is the menu description: house smoked duck pastrami; foie gras duck rillettes, violet mustard, orange brandy fig jam. i definitely could've eaten the whole thing faster than i could read that description. the pastrami was really good. i wasn't sure i detected the foie in the rillettes. it tasted like chopped roasted duck. if it was foie, there was something chunky mixed in. it was definitely good, but it wasn't what i was expecting from foie. the figs and the mustard were each very good with the duck. the mustard was almost like caviar. the seeds were whole. liked that. pam and i were going to share the next two courses, but didn't really work that way. we ordered the wild mushroom salade. yes, salade. precious. 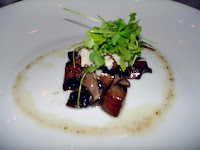 it was some mushrooms under a salad, er, salade, of fresh herbs and reggiano cheese. there was a banyuls vinaigrette. banyuls is a fortified french wine. oh, and that was where the black truffles were. i knew they were on something i ordered, but i was looking for them on the duck. they weren't there. i missed them on the salade. i got a couple of shrooms and some cheese, but this was pretty small, and became pam's dish. that was fine. not sure what the variety of mushrooms were. they looked like cremini to me, which are not wild. but that wouldn't be the first time i got cremini when i was told i was getting wild. we did share the shrimp, tho. 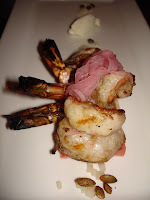 is was annatto chipotle grilled shrimp. there were pickled spicy red onions on top and a lime vinaigrette. the onions were awesome. it looked like pickled ginger, but tasted like pickled spicy red onion. the shrimp sat on a slice of watermelon, and the plate had a quenelle of goat cheese, and garnishes of tiny, tiny, tiny dice of jicama and toasted pumpkin seeds. it all worked together really well. pam mentioned how much she liked the goat cheese. good stuff. and three good sized shrimp. no complaints at all. we also shared an entree, and they split it up for us in the kitchen, plating it as two half orders, which i thought was very cool. 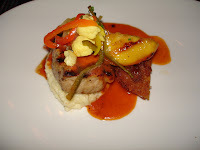 the menu description of this one takes forever: barbeque spiced niman ranch pork loin, white cheddar chili grits, fried green tomato, southern comfort honey grilled white peaches, mustard barbeque vinaigrette and cauliflower chowchow. whew. every part of this dish was spectacular (with the exception of the big chunk of gristle in pam's piece which made it hard to cut. but, eh, we can overlook that since everything else was good.) of particular note was the fried green tomato. we had really good fried green tomatoes at paula deen's restaurant in savannah, and pam said this one was better. i wouldn't argue. also, chowchow is a mix of pickled vegetables. i don't like cauliflower. this was good. for dessert, i saw the word scharffenberger in several places, so i knew i was getting something chocolate. 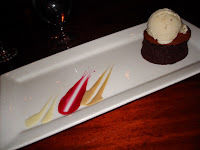 it was the scharffenberger hot chocolate truffle cake with raspberry blood orange sauce and malt ball ice cream. i was looking forward to the malt ball ice cream too. it was good, but my expectation of maltiness was higher. the cake was really good, a nice, soft chocolate. usually when we go somewhere with others, i try to rundown what everyone else had, but at a table for 12 with most everyone doing 3 or more courses ... no chance. 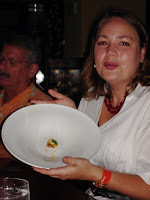 i know that kristen had the vegetarian tasting menu, which included this precious -- yeah, tiny -- course. to be fair, it was an amuse. but wow. nice plate. no, she hadn't eaten it yet. also, i know that phil had the tenderloin and liked it. and i know that nikki had the shrimp that we had, and she and ellen shared the dessert i had, and jeremy had the pork entree that pam and i split (and seeing his plate made me happy pam and i split one, actually). becky had the duck dish i had. jeremy also had a butter-poached lobster first course, and becky had the lamb chops as an entree. and for dessert, becky and jeremy split a cheese plate, but had trouble deciding which cheeses on the menu to not get. suffice to say, i heard not a negative word. i was totally oblivious to the dishes on the other side of our large, semiprivate table. but there was talk of bowing to the chef if he came out to see us. he didn't. oh, and we learned they are open for lunch. so we may be back soon. the title should get your attention. i made this up for a contest. i don't know if it will help me, but i am now soliciting views for the video i made as part of the entry. so, if you have three minutes, take a look, and feel free to view it with the sound turned off. i may come back and ask you to look again at some point. i'm not really sure, but there may be a voting round at some point. but for now, if you're interested, just help me build up my number of views. if you are vegetarian, feel free to avert your gaze. anyway, to see the video, click here.